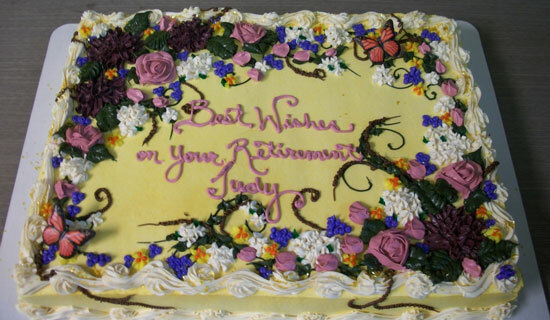 After 40+ years working for Marlen Textiles, Judy Wildt has retired. Anyone who has called the plant has talked to Judy, as she had been the front line ambassador for the company. She has dealt with every type of phone call, email, fax, and letter (yes, when she started there was no email or fax, just old-fashioned letters and phone calls). She entered orders, sent out samples and color cards, kept track of production order worksheets, made sure shipments went out when promised, corrected any errors or problems and many other things. Originally hired in the early 1970’s, when the location was owned and operated by Kellwood, she continued when the facility was spun off and became American Recreation Products in the early 1980s. She was there when DASH Multi Corp purchased the facility in 1989 and changed the name to MarChem Coated Fabrics. She was there when a second production facility was closed and merged in to the location in New Haven, MO in 2000. She was there when MarChem Coated Fabrics, became MarChem CFI in 2008. Then in late 2012, when MarChem CFI was sold to another ownership group and became Marlen Textiles. Judy certainly is a survivor. She “survived” four different owners and five different names! She was working for the company before Top Gun even existed! Through it all Judy had maintained an excellent work ethic and always put the customers interests first and foremost. “Judy never once complained and never once got mad” said current plant GM Dave Fischer. “Also, no one ever complained about her, no customers nor any other employee.” Executive VP Alan Prelutsky stated “Through all the changes we have made since 2008, Judy never questioned the changes and always did the right thing for customers, fighting on their behalf to make sure they were taken care of as best as we could. I always considered her the soul of the company.” With Judy leaving goes a lot of knowledge. But not to worry. Judy has been training her replacement, Wendi Gale, since May. Wendi has been an employee for Marlen for almost 3 years, working in the plant as a winder, inspector, operator, so she is well suited to understand the nuances of our products. Wendi can be reached at wgale@marlentextiles.com. We are appreciative of Judy’s long tenure at our company. We thank her for her many years of excellent service, and wish her well in the next chapters of her life. You will be missed! There be happy campers in the Adirondacks! Marlen Textiles, through its outreach program, donated fabric to Awning Cleaning Industries/ APCO Products to help create a free-standing awning over a picnic table area for a non-profit religious camp that runs primarily on donations. 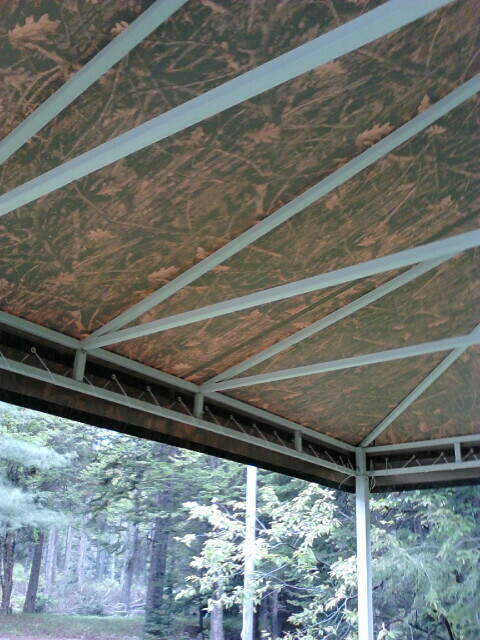 And not only is the fabric functional in keeping sun and water away from campers, the aesthetics are also pleasing. “We were pleasantly surprised of how wonderful the view from underneath is. On the sewing table, it appeared to be a solid tan but as we put it up you could see the graphics glowing through from the top side,” said Laurie Moers Northeast Regional Sales Representative. Dry campers are happy campers. Congratulations Camp! Marlen Textiles recently released Top Notch FR®, an 11.5 ounces/sq yard solution-dyed fabric. Top Notch FR meets California State Fire Marshall, NFPA 701, CPAI 84, FAA/FAR 25.853 and CAN/ULC specifications. It has better tear strength and dimensional stability than similarly constructed products on the market. Also, given that it is FR out of the box, there is no need to worry about sending it out for a treatment to make it flame retardant. Also, it is the first known FR fabric on the market that uses a halogen-free flame retardant system. TOP NOTCH FR® was specially created for applications needing flame resistance and unrivaled durability, tear, water and abrasion resistance. The fabric can be used for many outdoor applications such as commercial, residential and industrial awnings, tents, and canopies. Marlen also offers Top Gun FR (13.0 osy), Top Gun FR Lite (8.0 osy), Odyssey FR (7.25 osy) & Odyssey Open (5.75 osy) as flame resistant fabrics. 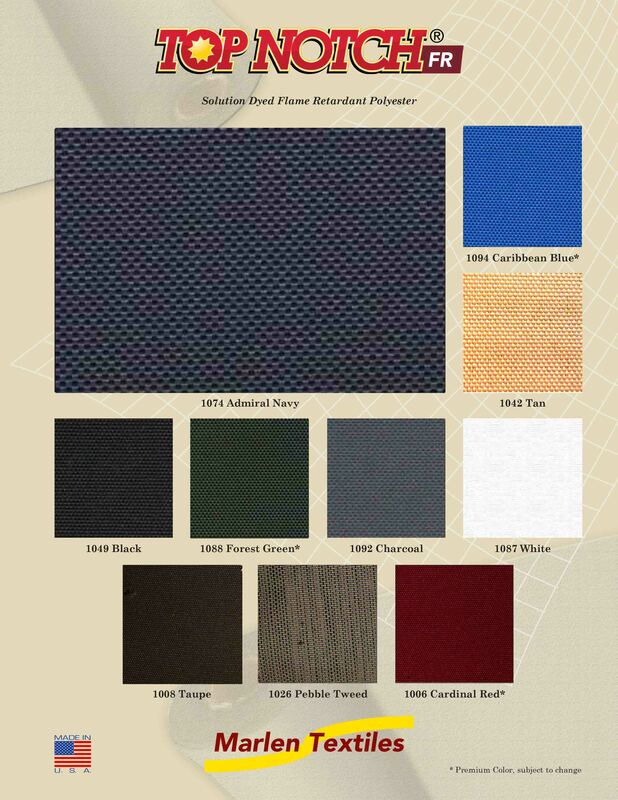 See below for what flame specification each fabric meets.